You need more than an entry-level job to pay the bills, but you don't have the time or funds to get a four-year college degree. Or maybe you already have a college degree, but it's not helping you find work. You could be a stay-at-home parent re-entering the workforce, or a midlevel manager who's sick of your industry and wants to start fresh. If this sounds familiar, you could soon be one of the most in-demand types of workers in America: the "middle skill" worker. More than half of all available jobs fall into this category. These are jobs that require more than a high school diploma, but less than a college degree — whether it's a certificate program, an apprenticeship, or on-the-job training. If you're ready to switch gears and retrain for a new gig, there are some fast and affordable ways to do that. 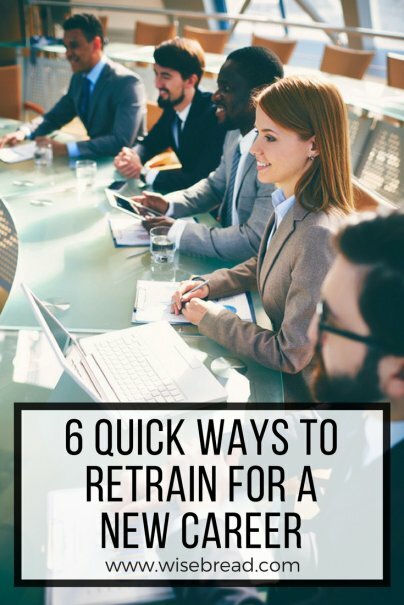 Even if you need to get retrained quickly, that doesn't mean you should skip the planning stage. Do not enroll in a training program without knowing what job you're going for and how much it would pay. If you haven't chosen a target industry yet, look at the ones with the highest-paying jobs that don't require a college degree. Once, these jobs were mostly found in manufacturing, but now they're more likely to be in the "skilled services industries," such as health care, finance, and information technology. Georgetown University lists the top industries and occupations in each state that don't require a BA; in Pennsylvania, for instance, the top industries are manufacturing and health services, and the top occupation is office and administrative support (median earnings: $51,000). You can also check the resources offered by your state development department; California, for example, lists the most in-demand middle skill occupations for each region. Also think about the job's future; check job growth projections and find out which workers may be replaced by robots. Besides this online research, you should get the word on the street in your community. Ask your friends and family what type of jobs their employers have trouble filling, what those jobs are like, and what they pay. Visit your local job center and study the openings. Finally, consider working with a vocational counselor or career coach who could guide you. If you recently lost your job, your local workforce agency or your former employer might provide you with this kind of help for free. If not, it may be worth the money to hire one out of pocket. Make sure you find a counselor with experience in the middle-skills market — not an executive recruiter or coach — and make it clear what you want out of the relationship before you start. Local research is probably your best friend here, too. If you can land an informational interview at a prospective employer, find out what certificate, associate degree, or other training they look for or require. Ask contacts who are already in your desired field where they trained and if they would recommend it. Perhaps the most important question you can ask about a job training program is whether it is connected with local companies that hire graduates. Programs codeveloped by hiring companies, or otherwise "demand driven," produce graduates with higher employment rates. Having teachers who work full-time in the industry can be a plus, too; when my husband was training to be a video game artist, he ended up getting hired as a part-time game tester by one of his teachers, and that job later led to a full-time artist position. Registering with one or more temporary agencies can be more than a way to make ends meet while researching your career move; it can be a way of conducting that research. Think about it: If you apply for a job or even attend a job interview, you get a very limited peek inside the company. But as a temp, you'll spend all day on the inside. You could be exposed to job roles you might not have even known about. Ask questions of everyone you work with, from the agency staff, to your on-site supervisor, to co-workers. If you like where you work, try to get trained for a better job within the organization. You might approach a manager about this, or you could ask human resources what education programs the company has. You might also discreetly talk to other managers, or browse internal job listings. I recently met someone who had been driving a forklift at a large grocery warehouse, until the company paid for her to get trained in refrigerator/freezer repair. Now she makes more money and has more job satisfaction, without ever having to interview for a new job.